Works with Ask Proxima and Infocus projectors plus select Dell, Hitachi, Toshiba and Viewsonic projectors and other devices with M1 connectors. The M1 connector is a new connection type also commonly known as the EVC or P&D connection. Many new projectors on the market utilize this new technology to provide the flexibility of connecting to either VGA or DVI inputs. This adapter provides you with the flexibility to utilize your standard display cables to connect to these new projectors and other devices that employ the new universal M1 connector. 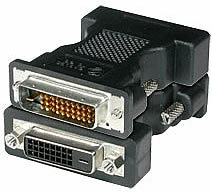 We also have M1 adapters available in M1 Male to DVI Female or VGA Female. For Ask Proxima and Infocus projectors plus select Dell, Hitachi, Toshiba and Viewsonic projectors and other devices with M1 connectors. The M1 connector is a new connection type also commonly known as the EVC or P&D connection. Many new projectors on the market utilize this new technology to provide the flexibility of connecting to either VGA or DVI inputs. This adapter provides you with the flexibility to utilize your standard display cables to connect to these new projectors and other devices that employ the new universal M1 connector. 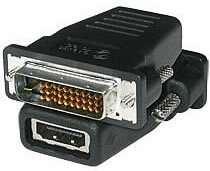 We also have M1 adapters available in M1 Male to VGA Female or HDMI Female.